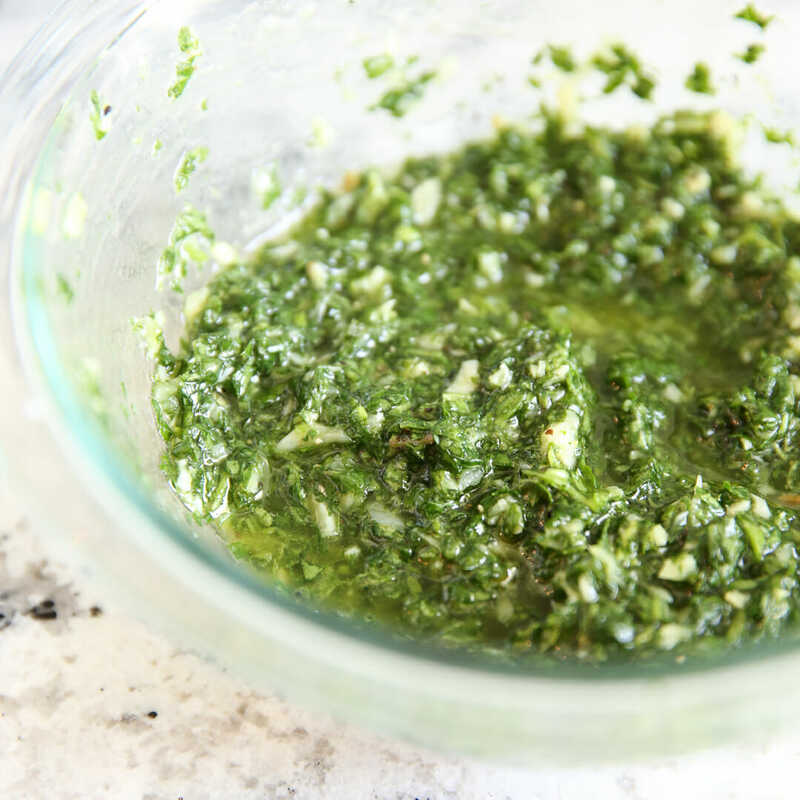 If you’ve never made Chimichurri Sauce, it needs to be on your must-make list asap! Chimichurri is a popular South American (primarily Argentine) sauce- you can basically think of it as Latin Pesto. 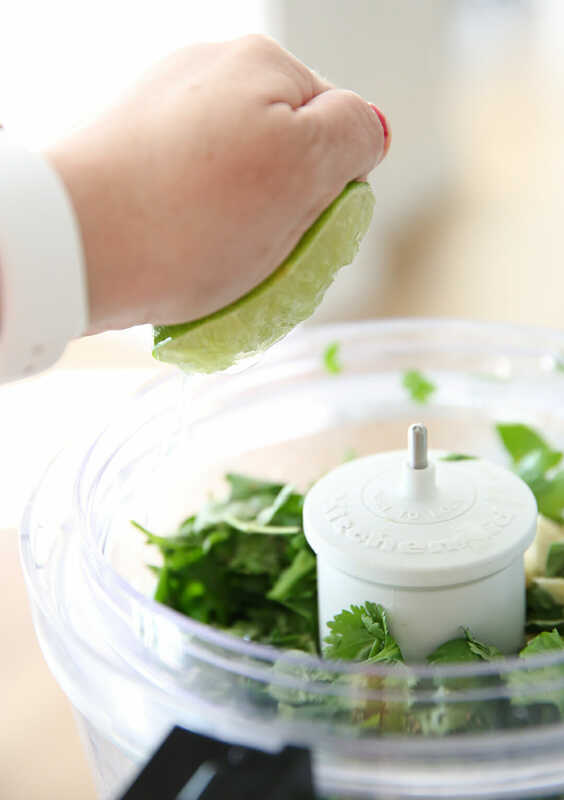 Instead of parmesan and basil, we’ve got parsley, cilantro and lime juice. It’s pulsed together with fresh garlic and olive oil and it will take your grilled meats next-level. Chimichurri is amazing on grilled beef and pork in particular, but also chicken, fish and veggies. We love slathering it on chunks of crusty bread as well. 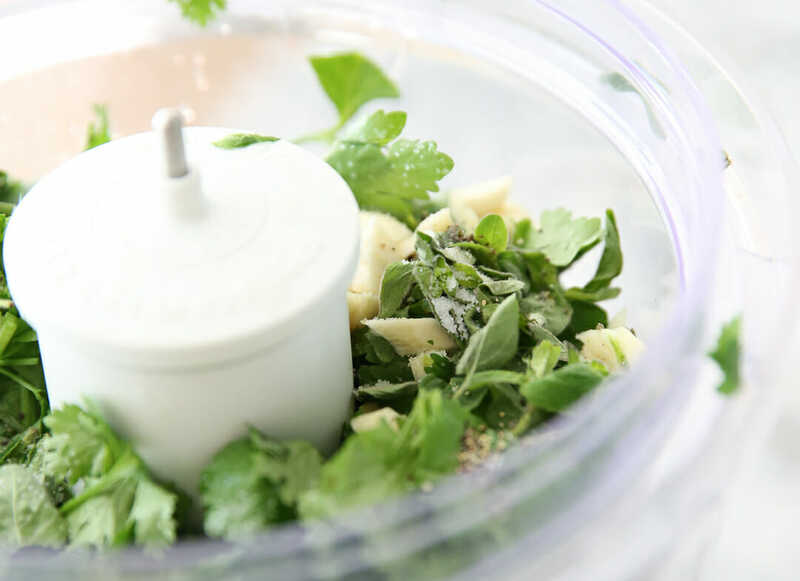 This Chimichurri sauce recipe is so quick and simple to make, I’ll teach you! This is a great recipe to make when you’ve got herbs in your fridge to use up, or growing in your garden. The bulk is parsley and oregano and we’ll use a smaller amount of oregano as well. 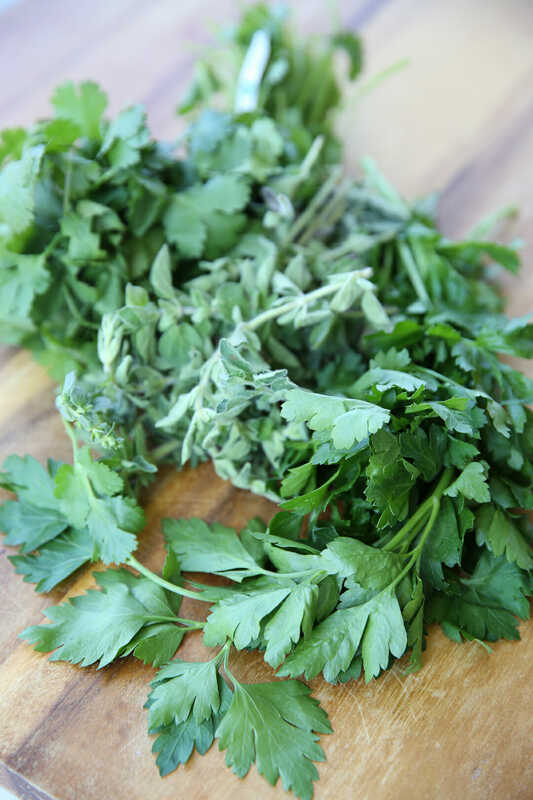 When you’re cutting your herbs up, remember you can cut the parsley and cilantro stems and all- just give them a rough chop to measure, but for the oregano, you’ll want to pull those little stems off the woody stem. It all goes in a food processor and gets chopped up more. We’ll add in some bright, fresh lime juice which gives it the most wonderful tang. And then with the processor running, drizzle in olive oil. 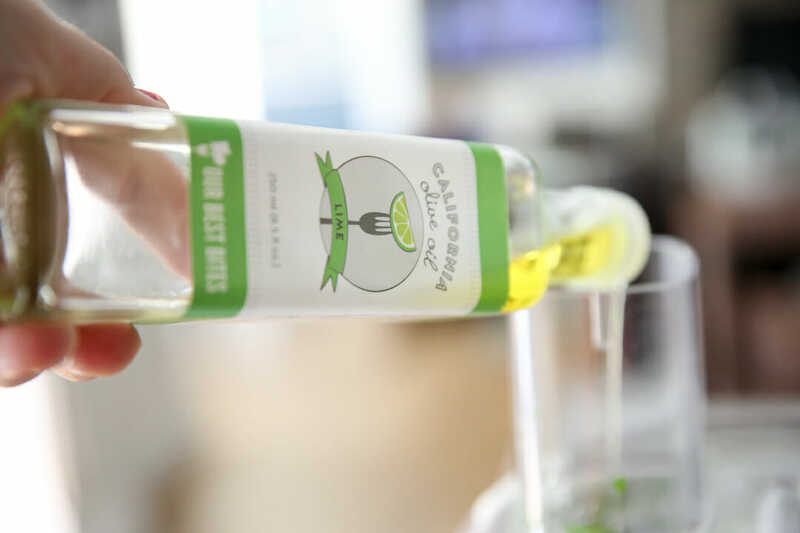 Our Lime Olive Oil is amazing, here! Did you know Lime is one of the flavors of our oil you can purchase on Amazon?? When it’s done you’ll get this gorgeous bright green mixture. Give it a taste and add more salt and pepper if you want. At this point you can also stir in some red pepper flakes if you like it with a little heat. I served this over a Snake River Farms Tomahawk Steak, which I kid you not- was the best steak I’ve ever eaten in my life. They are a great source of quality beef (and a local Idaho company) I absolutely recommend! I also love Chimichurri over Roasted Sweet Potatoes – you can find my recipe for that, by clicking here! Hope you whip this one up this summer! 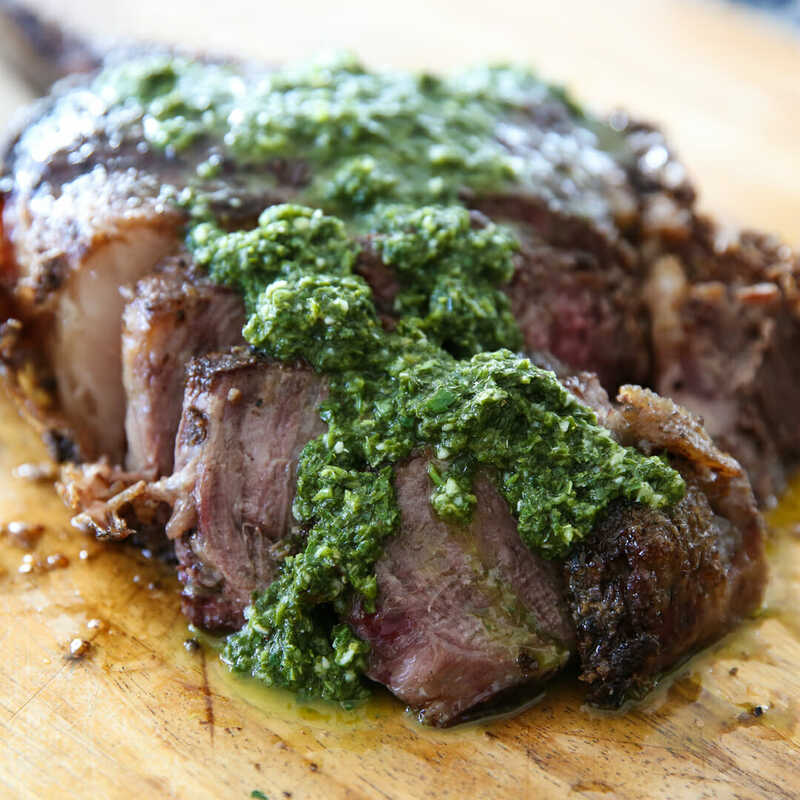 A bright and savory herb sauce, amazing served with grilled meats or vegetables. Place all ingredients except olive oil in a food processor and process until chopped up. Scrape down sides and then with processor running, drizzle in olive oil until it reaches a consistency similar to pesto. Don’t over process. If desired, stir in some red pepper flakes by hand. Serve sauce with grilled meats and vegetables. My uncle gives my mom a cut (of beef, usually) from Snake a river Farms every year for Christmas, and it is no doubt, the best meat ever!!! 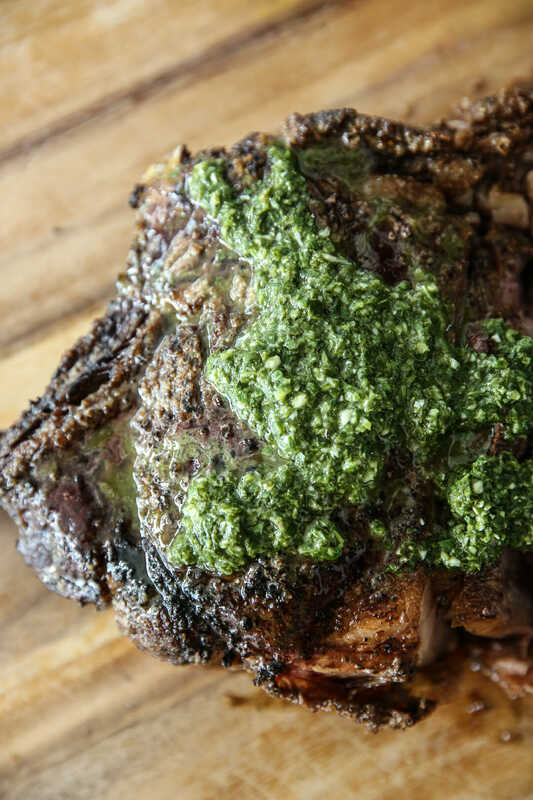 I absolutely love chimichurri too—it’s my favorite way to eat meats—we love it on our Raclette grill with melted cheeses and sliced French bread, roasted potatoes with all the other veggies too. Mmm! Oh my gosh I loooooove Raclette! This looks so good! I wish I was having some for breakfast right now! Ooh, I want to try this with carrot tops. And the fact that it doesn’t have any cheese (like pesto) might get my husband to eat it with me! Thanks!